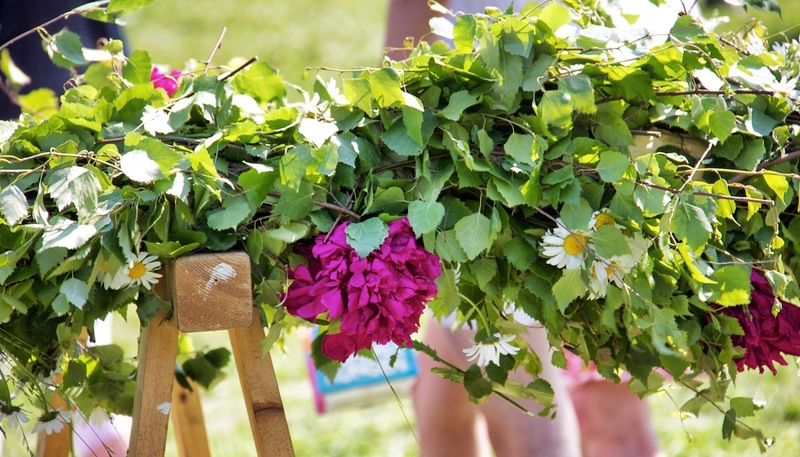 And also Midsummer’s Eve: a major holiday here in Sweden. And then lifting it up into place as a team effort. And light and the burst of growth that occurs during the short Swedish summer. For more traditions, please visit: Our World. 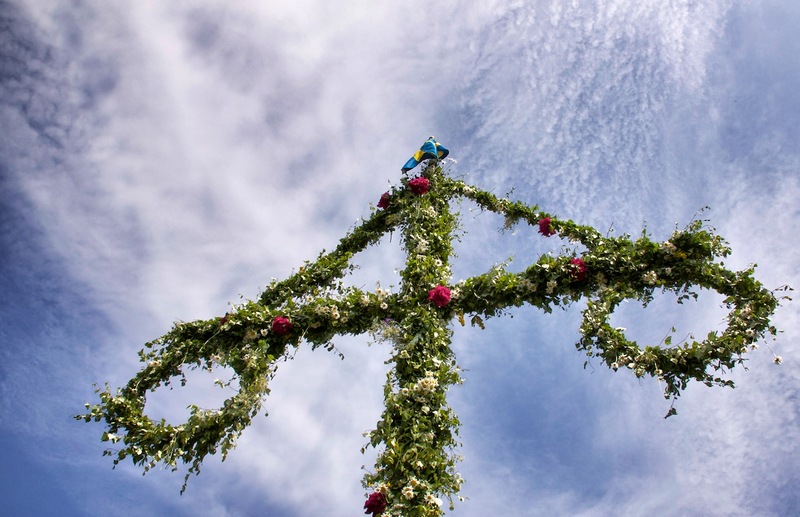 Posted in Culture, Our WorldTagged dancing, fertility, little frogs, maypole, Midsummer, pagan, Sweden, tired dogBookmark the permalink. I always enjoy the solstice celebration despite being an atheist. There’s a beautiful and marvellous sensation about honouring earth, nature and the elements. Great shots. Many thanks. What fun indeed!! Love the May Pole! And I love the picture of you and Oscar, of course!! A great look at your world today! Enjoy your week!! Beautiful flowers on the May Pole! Nice to see you and Oscar and your part of the world! We had dinner at a country club in Malmo when we were at the Rotary Convention in Copenhagen. 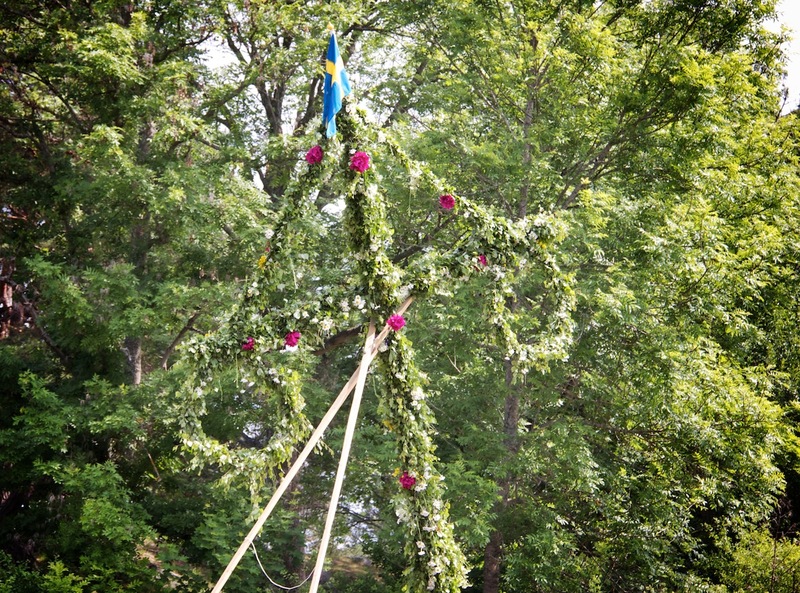 During the evening festivities we were entertained with a Maypole dance and Midsummer’s eve celebration! It was quite fun! I like the May pole and flowers! A nice celebration! It is also nice to see you and Oscar is always a favorite of mine! Have a happy week! You look like a high priestess in that photo! I love it! What lovely photos all of them. Oscar has the right idea, doesn’t he. But then if anyone was ever meant to dance around a maypole, it is you! Gorgeous! Great party .. And Oscar napping in the grass is the greatest. Midsummer is a great time to be silly. We had half a gale and stayed inside! smiles…pretty cool…i went to a solstice festival over the weekend and it was a very merry time…cool shot of the maypole too…think i might go in search of that nap now…smiles. Fantastic shots. Looks like a fun time. Oscar’s got the right idea. What a nice tradition. I wonder how many years it goes back…thousands, maybe? I’m referring to dog naps in summer, of course. Hello to you – is this the first photo of you I’ve seen in all these years? Oscar may have the right idea – it IS a long day after all. Love the sunshine and noticed you had your phone in your hand. Where’s the camera? My daughter took my photo with my camera! I had my phone in order to snap some quick shots. What a beautiful tradition to celebrate! Great shots. Lovely flowers. Happy Spring and Summer. Yes Fi …. A time to have fun …. pretty garlands happy faces. Gorgeous. And I love your earrings too. You and Oscar are in SWEDEN??!!! I always just assumed you lived in some specially beautiful zone in rural North America. Yes, I’m an ex-pat Brit living in Sweden! Wonderful shots from the event. People are having great time. The Maypole is so pretty. 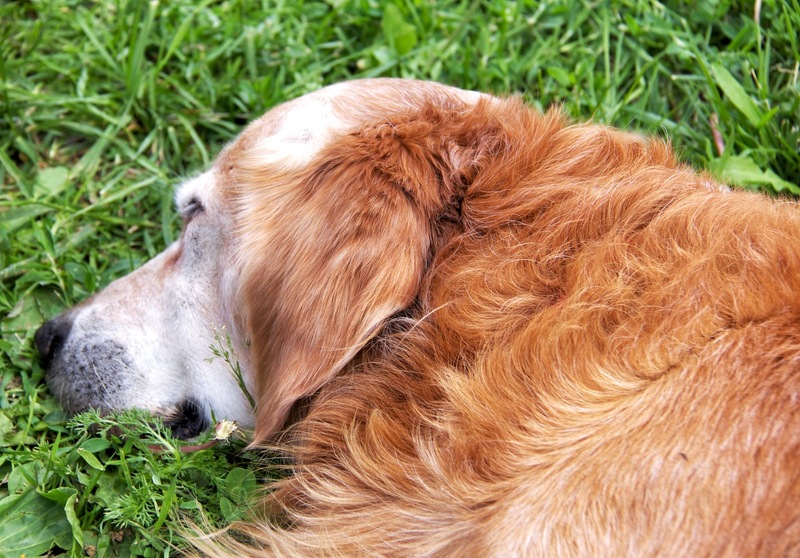 I’m with Oscar…a nap is the grass sounds delightful! oh the gift of being able to be “a bit silly” and not being afraid to share it! Wonderful. And what a glorious tradition this seems to be in Sweden. Wondeful! I wish I was there being a bit silly too! Have a great week, and thank you for stopping by my blog this today. Beautiful flowers and lovely summer photos. I always thought that the maypole dance was reserved for May 1st. How wonderful that it is used on the solstice! Yes, precious pictures, beautiful floral wreath! Best regards! Ah, midsummer, you can’t beat it, Fi. Beautiful photos from the celebration! Your expression says it all is well. Lovely captures! Great to see you in your element and Oscar chilling! 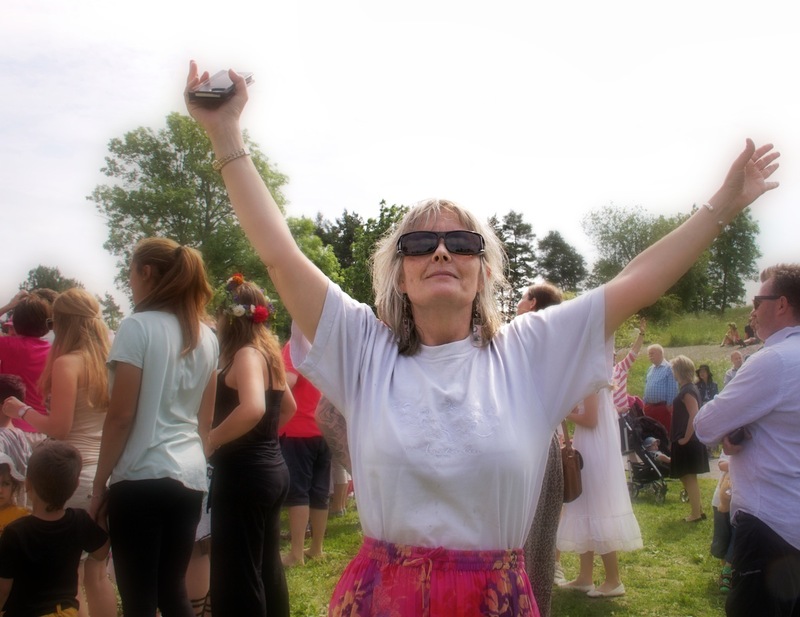 Midsummer’s day – I can’t think of a better day to celebrate. You seem to be having a really fun time. It is a magical time after all!! Boom & Gary of the Vermilon River, Canada. Beautiful Maypole! Maypole soaring into the blue sky looks singing a song in praise of sunshine, and you, too, ladyfi. Methinks midsummer madness is more than acceptable Fiona, love Oscar’s idea of a nap in the sun 🙂 gorgeous Maypole.. Your pictures have added Sweden to my bucket list! Beautiful. Det må ha vært en fantastisk feiring av midtsommer! Jeg elsker bildet av den søte hund som hviler. Nydelig Maypole under en nesten skyfri himmel. Takk for besøk på mitt siste innlegg! This looks like it was such a fun time!! You look happy 🙂 and Oscar looks tired LOL. The midsummer celebrations sure look a lot of fun. I hope you had a good time. What a GORGEOUS tradition…now why don’t we do this in the states? Just love this! New to me. Nice shots of celebrations. Hi! Nice summer solistice day. Your photos are very fantastic and very beautiful. Wishing you a wonderful day. You are lucky ! we sit in the rain and cold and I had to put the heating on. I am not talking about the north pole but about Belgium ! I’m enjoying learning more about these festivities! I think they’re wonderful. I spent the late evening in the woods near my home, and nature shared all sorts of treats with me, including otters and bats. It’s such a magical time of year! Sounds like a great tradition and glad to get a glimpse about it through your blog. Lovely pictures. What fun this must be, and the maypole is so beautiful! Lovely flowers! And I agree with Hilary, you should show yourself more often here, great pic! And if you don’t mind me asking, could you visit my blog and see what I posted in English? I started it a few days ago and I could use some helpful hints or just thoughts on it. Beautiful tradition! Summer is flowers! Oscar is wondering what all the fuss is about! Happy Midsummer’s Eve, a little late. That looks like a fun celebration! was the Queen of the May, do they have the May Queen? Sweden looks wonderful in the summer. cheers. It’s so nice to see the pretty face behind the pretty photos! You are adorable and almost float in happy silliness! May you never outgrow that love of life. Love the festival and seeing how it is celebrated in your country. Lovely traditions! I love the vines wound around the poles. Wow, what a treat this week, sure shots and excitement all around,,,rven Lady Fi in the flesh,lol. to nice to meet you my friend. oh, you look great my friend! Look how beautiful you are! And so are your flower poles. It looks like you had a perfect day for it. Nice to see you. I didn’t realize they still have may pole dancing in some places. That’s great. That’s a wonderful tradition and thanks for sharing it with lovely pictures. I love being silly, too! Great post for OWT. Thanks for playing along. Love those decorations on maypoles. So typical of your corner of the world. Great shots of a wonderful tradition!